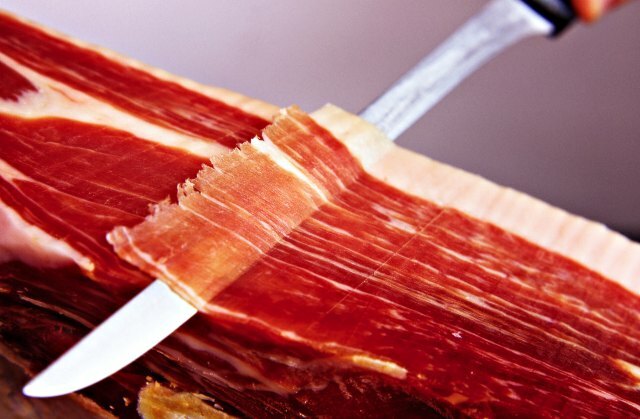 What is the difference between Jamón Ibérico and Jamón Ibérico de Bellota? Ibérico refers to the black Spanish pig. Bellota literally means acorns, or acorn fed. Jamón Ibérico is made from an Ibérico pig that eats normal feed. Jamón Ibérico de Bellota refers to Ibérico pigs who are free range and feast on acorns. How do I serve Ibérico ham? Serve very thin slices at room temperature. It should be savored with a dry, refreshing wine. Like caviar, you only need a couple of ounces per person to enjoy this delicacy. Jamón Ibérico does not need to be cooked. How do I store Ibérico ham? 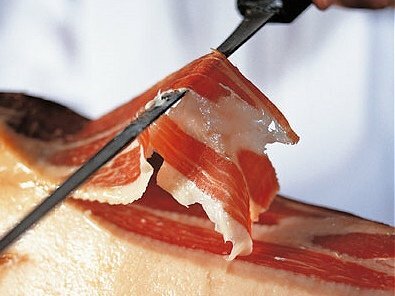 Boneless or sliced Jamón Ibérico should be kept chilled until it is served. It can be stored for a couple of months as long as it is in its original packaging. Once opened the sliced ham should be eaten within a day or two. The boneless can be kept for weeks as long it is carefully wrapped and the cut surface is covered in plastic wrap. The bone-in ham can be stored at room temperature after it is taken out of its packaging. It can last several weeks on a ham holder as long as the cut surface is covered with plastic wrap. The cut surface can become dry or have a slight amount of mold if left for more than a couple of days, but this does no harm - simply discard the first slice and enjoy the remaining ham. How many people will a Jamón Ibérico serve? A pack of slices will serve a few people one time. The whole hams can serve up to 50 people at one event. Whole hams can be enjoyed by several people for a number of weeks as long as it is well cared for.